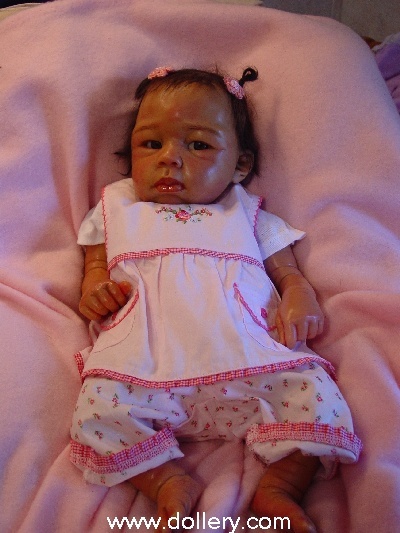 Many of you know Lorna is famous for her beautiful one of a kind realistic looking babies. Lorna's babies are so popular and she only works with less then a handful of dealers. We are honored to have represented her work. Email kmalone@dollery.com to be added to our mailing list for her work. For 2007: Lorna is currently working in cernit with her one of a kinds and doing small editions in silicone under 30 piece editions. She is also working doing small editions in resin and silicone in affordable price ranges under $200.00. She is a very busy artist! Lorna's Bio Courtesy of the Artist herself: Lorna was born October 7th in Nassau, Bahamas. At age 16 she came to the United States to attend California College of Arts and Crafts. She received a degree in drawing. Lorna has been married to her husband Barry for 7 years. Lorna has 4 beautiful children, 2 boys and 2 girls. When Lorna is not sculpting she enjoys spending time with her family. Lorna and her husband always reserve at least one night a week just for family. Lorna began sculpting in 1990. She just decided she wanted to sculpt and she did. She has never had any formal training and is completely self taught. In 2000 she decided to make the change from children size dolls to babies. 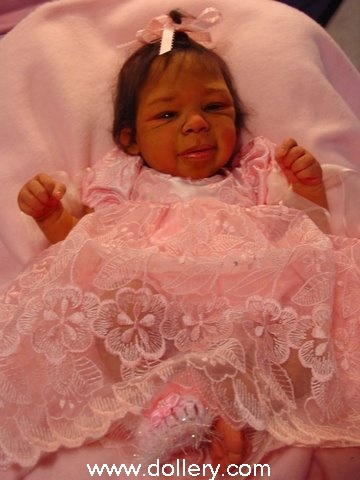 Lorna took the baby world by storm with her beautiful and realistic black babies. When asked if anyone inspired her baby sculpting she responds, "Shortly after beginning to sculpt babies I saw the work of Eva Helland. Eva's work inspired me to create very realistic babies. After all she is the diva of babies. "In May 2004 Lorna and her brother Levi Symonette created the company LMS Designs. It has always been a dream of Lorna's to have her own company and bring high end yet affordable collectibles to her collectors. (These are the small edition affordable resins which we will have further information on soon. More about the artist: Many of you may be familiar Lorna Miller's work as she has been making beautiful African American dolls for over a decade and a half. 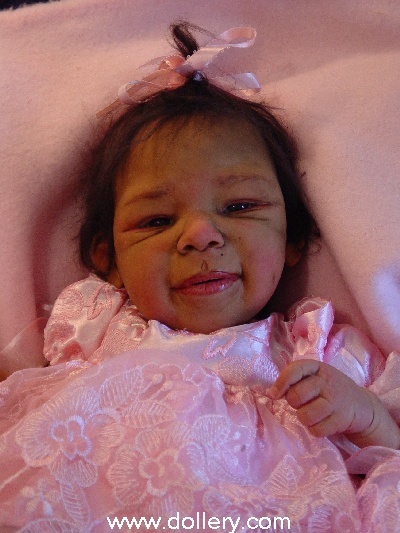 About ten years ago she took a break in doll making (for about 4 years) and had her beautiful daughter! We were thrilled when we saw her come back to her profession about six years ago doing her one of a kind children like Alexia below (sold). These were all full body sculpts. We were pleased to have Lorna participate in our Annual doll show in 2000. 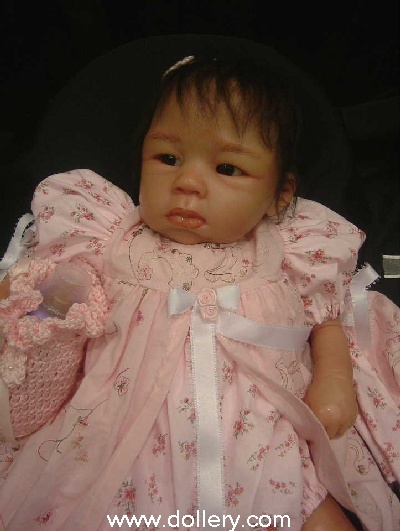 In late 2000 for our show and in 2001 Lorna began making one of a kind babies that have just taken off in popularity! These are cernit with cloth weighted bodies. 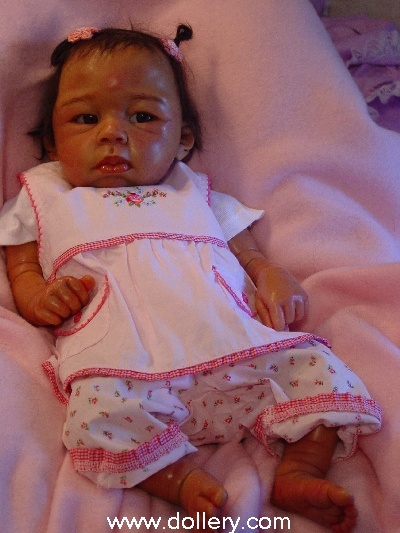 Her dolls have always been extremely realistic and in the last four years she has really mastered her profession. 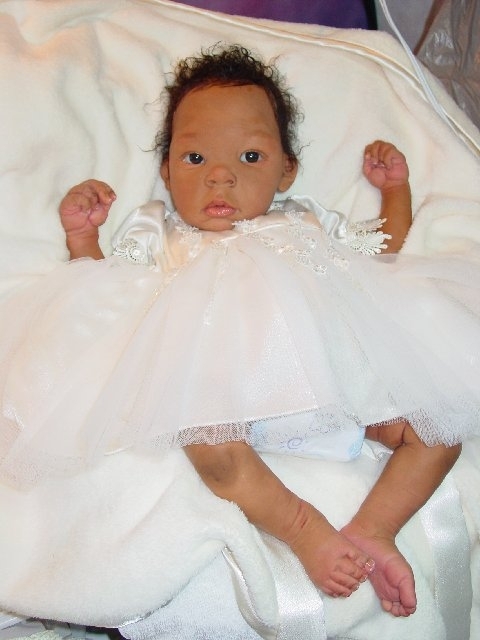 Her dolls have a beautiful smooth finished look to them now in addition to their amazing life-like qualities. 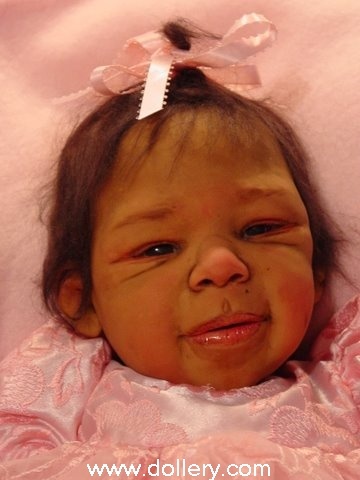 Currently Lorna only creates one of a kind babies in the $2000.00 plus range that sell out extremely quickly. We do have just three of her small ltd. edition resins available which were first introduced in 2002 and which are no longer being made. Lee Middleton doll company picked her up as an artist as well as Ashton Drake in the last few years and this year (2005) she is introducing her own smaller resin editions in resin (more info on this soon). There have been many wonderful articles written on her and in recent years she received a special award from her peers in "Artists United" (an organization representing many of the one of a kind artists we handle). Lorna is on fire and her work is in high demand! She deserves it being one of the nicest, down to earth artists we know. 19" One of a Kind, Fimo and Super Sculpey cloth body with pellets. Dark Brown glass eyes, hand applied mohair. Anya is wearing a sweet pink romper and sheer embroidered skirt. Asiana, Show Priced at $1,500 SOLD! Resin, LE/15, 2 versions! Dark or light skin tone. She has dark brown glass eyes, and hand applied angora mohair. She is 20". This is the dark skinned one. Outfit varies in style. Same as Asiana buy in a lighter skin tone - more Caucasian. Call regarding availability. Resin with cloth body, mohair, 8 1/2"
Summer is a limited edition of 13 and bi-racial. $2,000 Call or email kmalone@dollery.com regarding availability. 1-781-447-6677 in Massachusetts or 1-800-447-3655 outside Ma. All outfits will be of a similar style. Her mouth will be open a little bit and will be able to receive a modified pacifier. She will have 2 open hands. 12 inches, Silicone with cloth body. $2,000 Midyear Introduction! Silicone arms & legs, cloth bodies, silicone pellets & fiber fill. Glass eyes and rooted mohair. LE 28, 21" with bent legs. Brealee is a combined portrait of both Lorna's daughters Brea and Baylee. She is completely poseable and huggable. hair style which we recommend! $2,395 One of a Kind, Fimo & Super Sculpey with cloth body, closed eyes, mohair, 22"
$1,850, LE 30, 19" with bent legs. Silicone arms & legs, cloth bodies, silicone pellets & fiber fill. Glass eyes and rooted mohair. $89.95 Resin with cloth body, 8 1/2"
This is a bi-racial skin tone. Call regarding availability. This is a Caucasian skin tone. Call regarding availability. This is the correct Ahria. The one pictured in the catalog is wrong and is not available. $99.95 Resin with cloth body, 13"
Limited Edition resin with weighted poseable floppy body. Mohair, painted eyes, comes dressed in a diaper, hat or bow. Each comes with a toy and blanket. 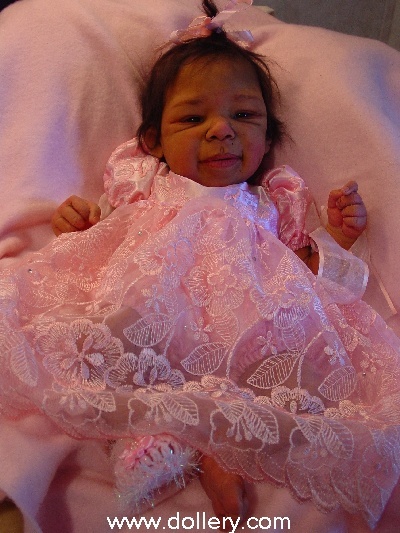 These 2003 resin preemie sized babies measure about 16 inches. They have a weighted pose-able body. They have painted eyes, mohair wigs and comes dressed in a diaper and a onesie. The have a fleece blanket and a stuffed toy.